Project plans to make your own handmade wood toys. 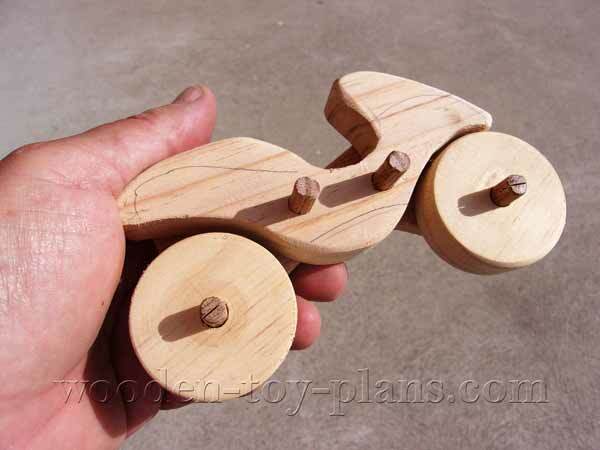 Starting with this unbreakable wooden toy motorcycle. Made from 1 inch and ½ inch project timber, wnich measures 19mm and 12mm thick. The dowels for the axels are 3/8 or 8mm diameter. The wheels are 2 inches or 50mm diameter. You can also make your own wheels. 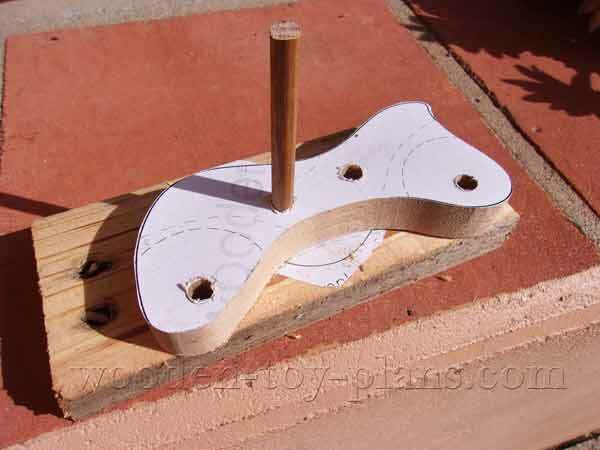 All you need to make this toy is a scroll saw or a band saw and an electric drill. 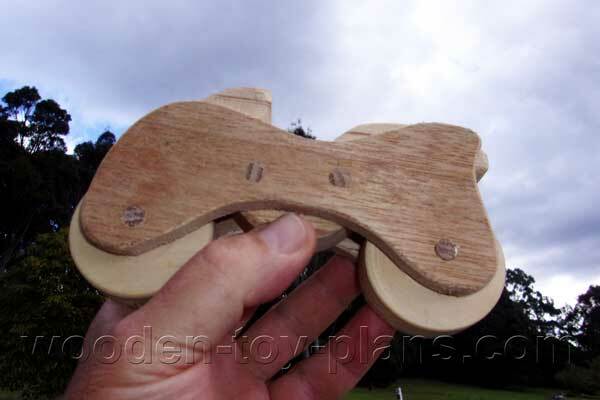 Download the free wooden toy motorcycle plans, complete with step by step building instructions. Print the pattern on your home printer or load it onto a USB stick and take it to your local library or office supply store. The paper templates are cut out and pasted onto the wood. Here I am using 12mm thick maple recycled from a bureau of drawers. To cut the two sides, I join the pieces with double sided tape. The paper template is glued on with paper glue. The middle section, shown on top, is made from recycled pallet timber, shown in its raw state. It measures about 23mm thick once it has been cleaned up. The wheels are made from project timber which is normally 19mm thick, so this gives the wheels enough clearance to spin freely. Cutting out the sides using a scroll saw. The two sides are stacked and held in place with double sided tape. To make sure the holes are properly aligned, the dowel is holding everything in place to drill the second hole. Dry fit the parts to make sure the wheels can turn freely. Here I have made a set of plastic washers from a milk bottle using a hollow punch. Note the pencil outline showing the areas to apply the glue. Round over the outer edges. I use a half round file and 80 grit sandpaper. Glue one side first with the dowels for the axles in place. The directions for the glue that I use says to clamp for at least 30 minutes. With the wheels and the plastic washers in place, the other side can be glued and clamped in place. Once the glue has set, trim the dowels flush, give it a final sanding and its ready for your favourite varnish or paint. Subscribe to my newsletter for more wooden toy projects like this one.